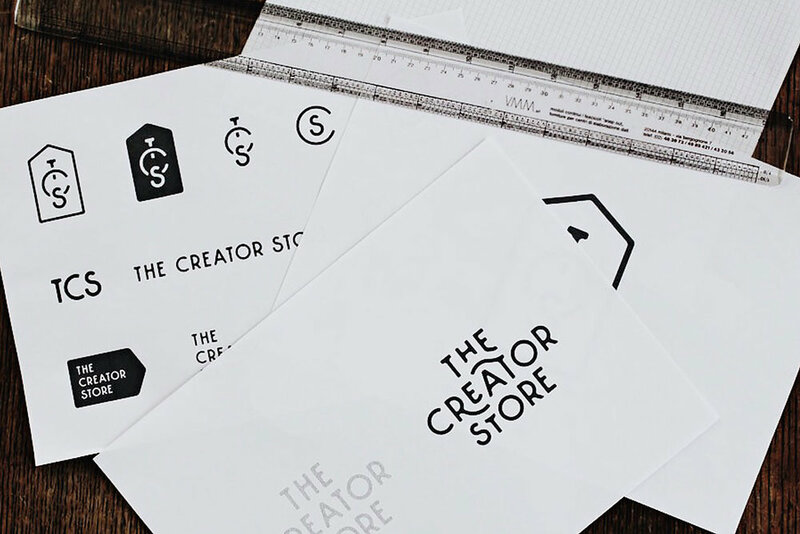 The Creator Store is a company from the United Kingdom that has the aim to help creators form all around the world to make their own merchandise. Many creatives, whether they be artists, musicians, or film makers, would want to set up a merchandise shop, to sell their very own products. Often, though, they are held back by the large amount of complications that they come across. 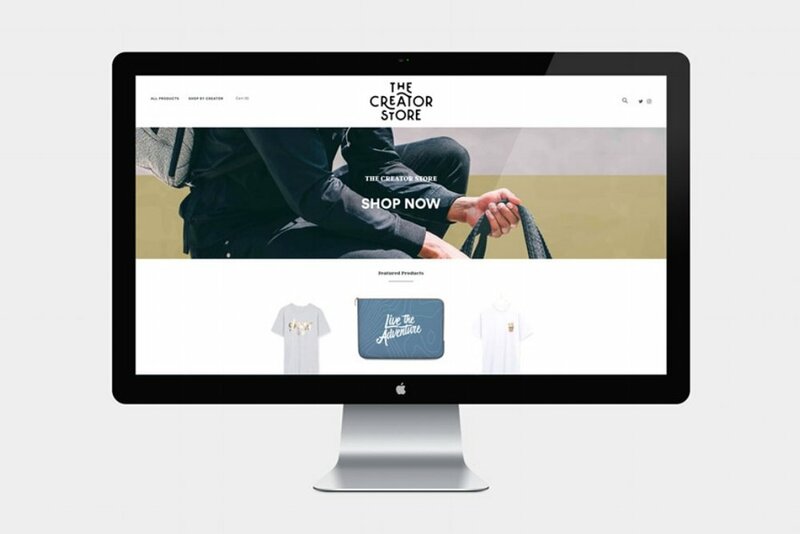 The guys over at The Creator Store help creators realise the great quality products they’ve always wanted to share, whilst taking care of orders, stock management, shipping and all that is necessary to successfully run a merchandise shop. So TCS essentially is a network of online stores. The creators have the opportunity to sell products while the company takes care of running the business, through an efficient, quick and smooth process. My task was to take care of the branding for The Creator Store. The client’s requirements for the logo design were simplicity and uniqueness. It was important to make the “creator” the focal point of the company, so it had to play an important part in the design layout. There were various possible approaches to this project, regarding the style of the logo. It soon became clear that a fully typographical setup would be the best direction. As long as the company’s name would be clearly legible, there would have been no need for additional illustrative elements. The name is sufficiently self explanatory, and communicates clearly what the company’s about: “a store for all creators”. Up next was to decide what style of typography would work the best. After some some thinking and experimentation, we decided that thick Sans Serif text would do the job just fine. It’s simple, bold, strong and straight to the point. Fancy Serif typography would have caused too much distraction and driven the focus away from the company’s values. Script, on the other hand would have compromised legibility and the design would have lost clarity. The projection of the brand’s identity, through a logo, needs to be immediate, so we had to avoid any kind of element that would get in the way. In order to have a compact design it was best to stack the words on top of each other. Of course, the key component of the company is the Creator, so it was extremely important to give special focus this central word. The first step was to increase its size, just slightly. Next, we ended up extending the leads of the letters “r” and “t” with curvy lines, which interact with the words above and below. With this strategy, “creator” automatically becomes the focal point of the design. The two extensions resemble smooth wave forms, which add movement to the composition and therefor stand for action and the smooth process the company works for. This reason also justifies the smooth edges of all letterforms. The client was also in need of a smaller version of the logo, to represent the company in different situations and on different media. Plenty of thinking went into this part of the project, as well. The goal was to create a monogram logo that would include the company’s initials: TCS. We worked with quite a few options for this design, such as a simple condensed version of the initials next to each other, the “s” surrounded by a circular “c”. The final choice was a concept in which the initials were placed vertically, in favour of consistency with the main logo, and to still make the “c” the biggest element and focal point. The finishing touch was to insert the monogram inside the shape of a tag. As the brand helps to set up merchandise shops, it was an image that fit the bill perfectly.